Home Science & Environment Education Punishment in Schools: A “Detention” Room for Students? 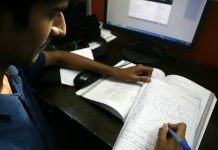 Schools and their rules have come under the radar after the gruesome murder of Pradhyumn, a student of Ryan International in Gurugram. 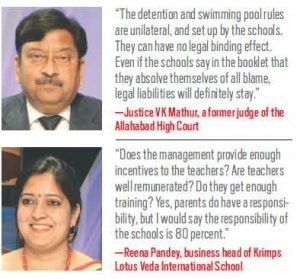 It is obvious that there is a huge disconnect today between school managements, teachers and parents of elite schools. 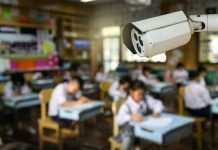 There are allegations that schools focus more on building a business and absolve themselves of all blame in case of an accident than providing a safe haven for children. The ancient guru-shishya parampara has largely been ignored and many have foregone their responsibility towards wholesome development of children. In fact, rules in certain schools are shocking, to say the least. For example, in the student diary of Delhi Public School, RK Puram, there are some rules that will never hold in a court of law. Under the Disciplinary Measures section, Point 8 states that the school has created special rooms for detention, called “designated rooms”. While detention in schools is not a new phenomenon, a special room for the purpose is surprising. It seems like forced confinement. This cannot be done without the legal oversight of an adult. It is also in contravention of the parameters laid out in the Juvenile Justice (Care and Protection of Children) Act, 2000. However, the diary does talk about special rooms. Detention in a special room designated for such a purpose is tantamount to forced confinement and could result in psychological pressure and trauma for the child. The basic instruction for public swimming pools—as standardised by the Pune Municipal Corporation in 2012—says that for every 20 swimmers, there should be one trained lifeguard. The lifeguards should have completed a training course from a recognised institute. Sehgal preceded this reply with the following explanation: “At the Swimming Pool we have trained coaches and licensed lifeguards in each shift. A trained nurse is on duty and an ambulance is stationed there at all times. In addition the Physical Education Department teachers are on duty along with a security guard.” If that is so, why does Point No. 13 state that the user of the pool would do so at his/her own risk? 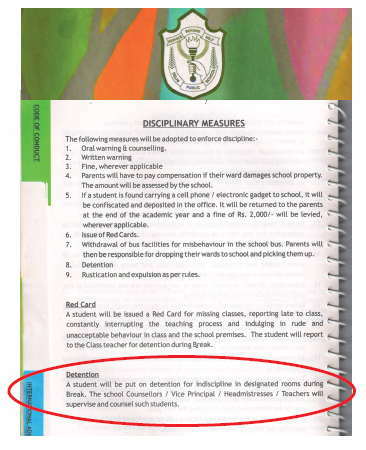 Similarly, Apeejay School, Sector 16A, Film City, Noida, has outlined its discipline policy in its diary. Point No. 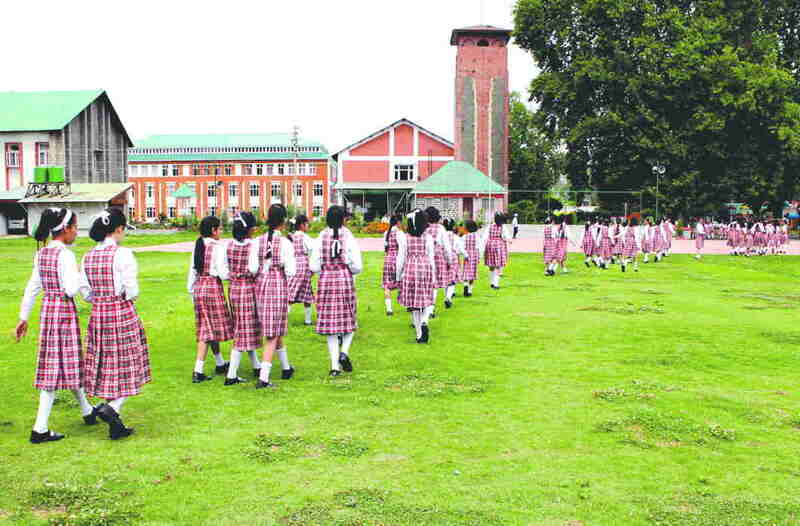 9 says: “The school reserves the right to isolate/suspend or expel a student with or without warning for any act of indiscipline and gross misconduct.” India Legal’s questionnaire to the school asked how it intends to “isolate” any student and put the blame on him in case of gross misconduct by a section of students. Till the time of going to the press, there was no reply from the school. 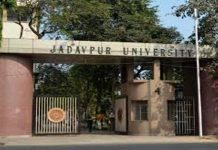 Dr Loveleen Kakkar, ex-additional secretary, Women and Child Development ministry, Madhya Pradesh, said that there were laws aplenty on this, but there is no implementation. “Are we creating a safe environment for children?” she asked. Dr Bharti Ali, Co-Director, HAQ Centre for Child Rights, and a parent, had a different take on this issue. “Why do we accept such regulations that will, obviously, not pass the test of law? We accept the fact that our children are in a famous school and our position in society moves up,” she said. It is obvious that there is a need for more parent-management meetings and for schools to lay down rules based on these inputs. After all, the safety of a child, the nation’s future, cannot be left to fate.